I’m after some advice on a little mobile set up. I have a Digitone and Digitakt, a set of headphones and a little handheld recorder. I’m just wondering the bast way to set this up. Run midi cable from one to the other so I can sync them. Does it matter which way around I do it? Will patterns change together? 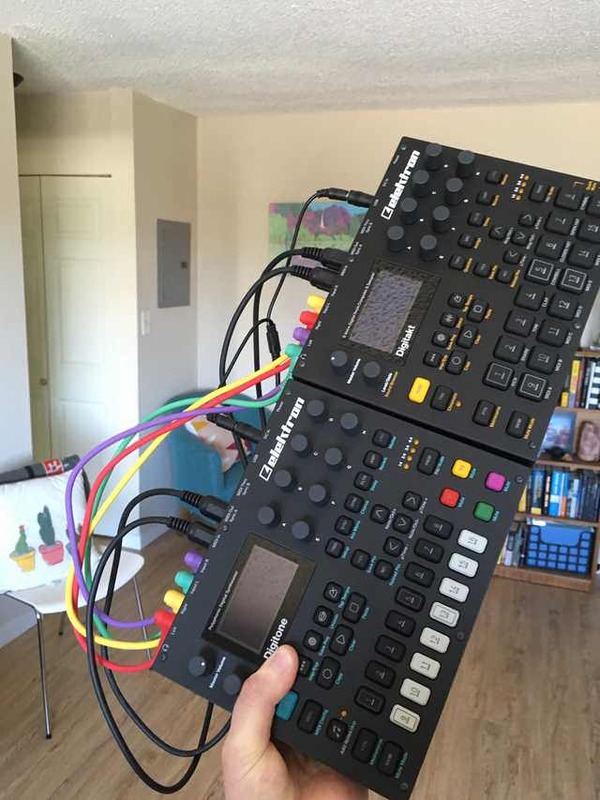 Run the audio of Digitakt into Digitone, plug headphones into DN so that I can hear both machines. Connect a cable from DN to my handheld recorder so I can capture audio. Make patterns and have fun! I’m not too bothered about the fact that I can’t sample Digitone with this setup. Are there any other fun things I could do with the two boxes together that I may not have thought of? Just remember to pan the DN inputs hard left and hard right accordingly. Also, if I remember correctly, unity gain on the DN inputs is around 27 (out of 127). If you crank the inputs up all the way, your already loud DT is going to be much louder and you will get some noise on the DN inputs. With the correct MIDI settings (not sitting in front of my machine right now but let me know if you have any trouble), this works well and pattern changes initiated on the host device sync up with the slave device. You could probably even use two MIDI cables to have pattern changes initiated on either device sync with the other. Not sure though. As far as fun things you could do, the master effects on the DN are amazing, and don’t be affraid to use the DN’s master overdrive (I was at first since I typically make pretty chill music). The overdrive saturates the sound in a very tasteful way and glues the whole DT DN track together. And if you are up for it, you could always attach your DT and DN together like I did. is that pretty sturdy or would you recommend another strip on the bottom holes? It is pretty sturdy but if I had thinner medal I would have done the bottom holes as well. @bpcook Where does the external output sound come from? From the DT or the DN? Something cool you can do: Use the DT midi tracks to p-lock the DN master input. Aside from the fx, you can use this to sequence the input level: volume or, effectively, on/off. I route the left and right outputs of the DT into the inputs of the DN to use the DN’s master effects (just as the OP suggests). The master out (aka the sound of the DT and DN mixed together) then comes from the DN left, right and headphone outputs. Let me know if that answers your question. Also, if I remember correctly, unity gain on the DN inputs is around 27 (out of 127). I connected mine together for the first time yesterday and this tip would’ve been useful. At the time, I was like “whoa, this thing gets hot at 25, what gives? !” but now I realize it just means there’s enough gain to run some lower level stuff into the DN like guitar, or maybe a piezo mic’d acoustic instrument like a kalimba or resonant garden-like thing. Very interesting… Running mundane things through chorus/delay/reverb (and/or overdrive) alongside the Digitone could be really cool. Or, just weird, but I like experimenting! pan the DN inputs hard left and hard right accordingly. Why would this be the case? Will the DN normalize the inputs to both channels? I should probably pull up the manual for some light lunchtime reading. Also - I love the DIY attachment of the two boxes. 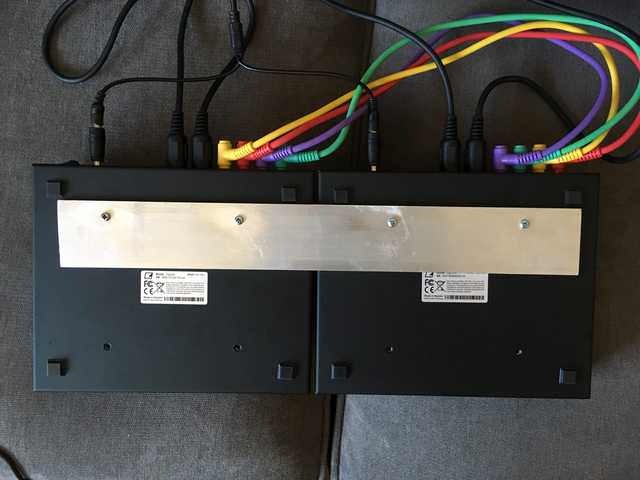 Check out my post in the “Your Setups” thread to see these two boxes mounted to a Temple Audio DUO 17. So far, that setup is doing what I need it to do. Yeah, the opportunity for experimenting is amazing. And you can run strange things through the DN effects and then sample them with the DT. By default the DN has the left and right inputs panned to center on the mater page. When plugging in a stereo device (like the DT), you will want to pain the left input left and the right input right to maintain the stereo devices stereo image. Thank you for this good straightforward advice! I’m not sure I’m following you here… do you mean p-locking the input volume so you can sort of program mutes? @bpcook I see you use a power splitter to connect both the DT and DN at one power supply. Can you give me a link where to buy this? Looks very handy. Excellent. That sounds like a fun little trick. Thanks hotscience! sometimes its easier to hear it from a person.